Beauty and the Beast Tales From Around the World (the link isn't active yet but it will be in the near future) will be released soon, so today begins some Beauty and the Beast posts which will continue until I run out of steam or bandwidth (being realistic here). I make grand plans and then life happens and well, you still love the blog anyway, right? Ideally, I will post every week day for the next two months because I have that much to share. Just a daily discussion of different types of Animal Bridegroom tales will take about two weeks. Then sharing favorite and unusual tales from the collection as well as some history can go on for several weeks. And so many of you are fans of the tale, too, so I want to share a lot since most of my thoughts are absent from the book out of necessity. For today, however, being a Monday and all, I'm just going to share the table of contents (at least the tales part) for the new book. The book begins with Cupid and Psyche and then offers strict ATU 425C Beauty and the Beast tales and then widens the scope to a range of Animal Bridegroom tales. Each of these tales fought for their place in the book and some others languish in my unused folders. And, yes, at times I chose to offer two translations of the same tale instead of a different tale entirely, but the translations offer interesting comparisons in style and content choice which at least I always find fascinating for a collection like this. Pretty much all of the single issue comics in the Fables Universe are currently 99 cents each on Amazon. Here's the link: Fables Single Issue Comics Sale . Well, the most recent, #133 is $2.99 which I believe is the usual price for all of these. There's 212 titles, so no, you won't be buying them all. Although that would be cool if you did. I admire that. But it's a way to read some of the series without a big commitment, or to read one of the side series in the universe. Anyway, I'm going to be quiet about it and just let you go explore if you are interested. By the way, these are best on color ereaders like tablets, but they can also be read in B&W on regular Kindles and other readers because I imagine they are on sale elsewhere, too, but I'm not taking the time to investigate. Mirror, Mirror by J. D. Robb and others was released this week and is usually $7.99 for the ebook on Amazon, but it is on sale this weekend only for $3.99. Even if you have already bought it--which I did--you can return it and repurchase at the lower price. It is also this price on Barnes and Noble. This new trailer for Frozen is more entertaining and gives hope for some general entertainment. But it has no resemblance whatsoever to HCA's The Snow Queen. I'm grateful they changed the title on this one. So unless more news shows a greater relationship to the fairy tale, I won't be covering the movie here on the blog. Tangled, at least, resembled the fairy tale and had recognizable elements. I'm not seeing that here. As you may recall, Disney infamously changed the title of 2010′s Rapunzel to Tangled and also altered the marketing campaign to highlight not its lead female would-be princess character but the wise-cracking male lead who would be her love interest and would-be rescuer. And, having successfully marketed Tangled as the merry adventure of rogue Flynn with Rapunzel seemingly playing a supporting role in her own story, Disney then went and announced that Tangled would be the last such fairy tale adaptation they would be producing. Because obviously The Princess and the Frog “only” made $267 million worldwide in 2009 primarily because it had the word “princess” in the title. $600 million in worldwide box office later (more than any other non-Pixar cartoon outside of The Lion King), they secretly changed their tune, which brings us this loose adaptation of Hans Christian Anderson‘s The Snow Queen. So yes, however small the victory, let us celebrate that Disney is boasting, rather than hiding, the fact that they have made another female-centric animated fable. It is a telling sign of how far gender parity has fallen in the last decade when something like this or Brave is considered noteworthy, especially as the female-driven animated features like Mulan or Anastasia used to come and go without comment in the mid-to-late 1990′s. But for the moment, kudos to Disney for not only bringing us another animated film co-directed and co-written by a female (Jennifer Lee, who co-wrote Disney’s Wreck It Ralph), but producing one starring a female hero and villain (Idina Menzel). And most importantly, kudos for not being afraid to hide the film’s female-centric bent in the marketing campaign, thus bucking the “girls will see boy movies but boys won’t see girl movies” conventional wisdom. One can only hope that the successes of The Twilight Saga, Tangled, Brave, and The Hunger Games is helping to dispel that myth. And I still contend that Princess and the Frog just wasn't very entertaining. The Princess title may not have helped but the film itself wasn't making people go back to see it. And it released later than usual that year, too, after Thanksgiving. Voodoo and characters that are animals longer than they are humans isn't appealing to as large an audience. Fine if we have animal characters, but when we know they are enchanted humans, well, frogs aren't that interesting. I'm usually entertained by Disney movies on some levels but I remember sitting with my sister to watch it and we were both thoroughly bored. It was boring. And I didn't want to be bored and I was rooting for a non-white princess, too. Released today: Mirror, Mirror by J. D. Robb (Author), Mary Blayney (Author), Elaine Fox (Author), R.C. Ryan (Author), Mary Kay McComas (Author) is released today. Those in the know know that Robb is Nora Roberts writing her Eve Dallas series. Herein we have an interesting mix of fairy tale retellings from an unexpected set of authors. Scarlet in the Snow by Sophie Masson will be released next week. When Natasha is forced to take shelter from a sudden blizzard, she is lucky to see a mansion looming out of the snow. Inside, it is beautiful: the fire lit, the table set, but mysteriously enough there is no one there. On the walls, instead of paintings, sit empty frames. In the garden, she finds one perfect red rose about to bloom, a vivid splash of scarlet against the snow. Dreamily she reaches out a hand, only to have the master of the house appear—a terrifying, gigantic creature who looks like a cross between a bear and a man—and demand vengeance on her for taking his rose. So begins an extraordinary adventure that will see Natasha plunged deep into the heart of a mystery. She begins to realize she has stumbled onto a great tragedy—a spell of revenge laid on the young man the Beast once was, devised by a powerful sorcerer. But even if she can break the spell, the Beast she has now come to love will be snatched from her. Natasha will have a long journey, and many ordeals, ahead of her before there can be a happy ending. 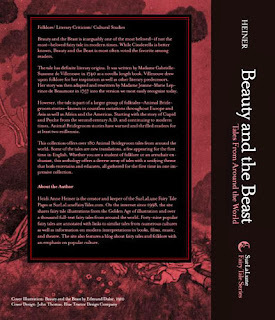 Here is the cover for the soon to be released Beauty and the Beast Tales From Around the World. This one has over 180 tales in it and has a word count of over 530,000 words with 828 pages. In comparison, Cinderella only had 442,000 words. 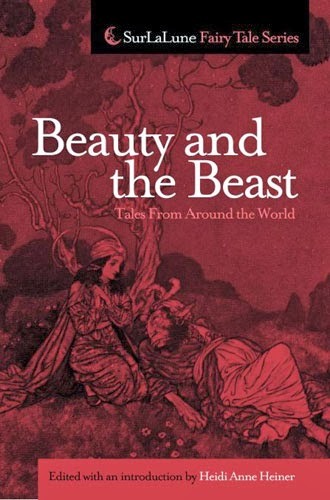 And I have enough material to offer a second volume of Beauty and the Beast tales if this one is well-received. I kept cutting material with the hope that a second volume will happen. I didn't want this book to end because this group of tales remains my personal favorite even after years of working with them. If anything, I love them even more. Each book in the SurLaLune series gifts me with a greater appreciation for these tales, but I am usually very much ready for them to be done, kaput, so I can move on to the next one. I only wanted this one done because it had to end so I could share it with others. And if you love Beauty and the Beast, I don't think this book will disappoint. I hope not! The book is coming in October and I plan to dedicate the month of October to the tale on this blog. So buckle up! Hero by Alethea Kontis will be released next week. Kontis wrote one of the most popular fairy tale themed novels published in 2012, Enchanted (The Woodcutter Sisters) . Hero is the second book in the Woodcutter series and will be followed next October by the third book, Beloved. So if you are a fan, you have more to read and anticipate very soon! Almost three years ago, I posted about the Petition to National Book Foundation on Behalf of Fairy Tales. Then last year it was announced that the stipulation against fairy tale inspired materials had been removed. Fantastic! Marvelous! News! The National Book Awards Entry Rules & Guidelines no longer exclude collections and/or retellings of fairy tales, folktales and myths. That in itself is cause for great rejoicing. And this week the 2013 National Book Awards Longlist For Young People’s Literature was announced. And a notable fairy tale related title is in on the list: Far Far Away by Tom McNeal. It's not a retelling of any particular tale, but the influence of the Grimms cannot be ignored--after all Jacob Grimm is a main character. And if that fills you with trepidation, don't worry, it's a fascinating book. My initial favorable reaction grew stronger the longer I was separated from it since it stayed with me longer than many other books do. Another finalist is The Real Boy by Anne Ursu. Ursu garnered SurLaLune attention a few years ago with her release of Breadcrumbs --a book unapologetically inspired by Andersen's Snow Queen--another highly recommended fairy tale retelling. And while this title to her nominated book alludes to Pinocchio, I don't believe it references the tale too much if at all from the previews I've seen. But it hasn't even been released yet, so who knows? There are many other wonderful looking books on the list--I've only read Far Far Away myself, but I am also thrilled with how many fantasy genre books are represented. After all, I am of the generation in which fantasy was always second class literature unless it was a rare Newbery Medal winner. I admit that I am grateful to Rowling--and so many other authors--for making fantasy so mainstream over the last decade. The canvas tote bags on CafePress are $10 through midnight tonight with coupon code TOTALLY. I own several of these and love them. Here's a link to the SurLaLune bags. Only applies to canvas tote bags, subject to availability. Coupon code TOTALLY must be entered at checkout. Promotion starts on September 18, 2013, at 3:00 p.m. (PT) and ends on September 18, 2013, at 11:59 p.m. (PT). Discount cannot be combined with other coupon code offers. All orders must be from the CafePress Marketplace. Offer not valid on bulk orders and any product numbers starting in 030. Offer valid online at CafePress.com only, and may change, be modified or cancelled at anytime without notice. This promotion cannot be applied to past orders.